For the men and women who will lace up their boots in Afghanistan or Iraq today, the only goal is to complete their mission and lie down to sleep tonight one day closer to coming home. It's not easy. Sometimes completing an ordinary mission requires extraordinary heroism. These are the stories recounted by Stars and Stripes in the 7th annual publication of "Heroes." 2011 "Heroes" tells the story of a few awarded for valor on behalf of the U.S. military's many brave men and women. In telling these stories about valor and sacrifice we also believe ‘Heroes’ honors all the men and women in uniform and the sacrifices and hardships they and their families routinely endure for the sake of all Americans. They come from every race, religion and walk of life and yet they share a bond few of us ever have to test: the willingness to put themselves in harm’s way for the sake of another. The stories of men and women who ignore their own peril to save others are no less extraordinary for being so commonplace among members of the U.S. Armed Forces. What earned some of these individuals a medal is the subject of “Heroes,” published by Stars and Stars and Stripes, the military’s independent source of news and information, and with the generous support of The Boeing Company. Now in its seventh edition, “Heroes” begins distribution of 1.64 million copies on June 14th (Flag Day) in honor of the many soldiers, sailors, airmen and Marines who have been recognized for valor in Iraq and Afghanistan. “The special section tells the story of men and women who have shown astonishing courage under fire. In telling these stories about valor and sacrifice we also believe ‘Heroes’ honors all the men and women in uniform and the sacrifices and hardships they and their families routinely endure for the sake of all Americans,” said Terry Leonard, Stars and Stripes editorial director. Publisher Max D. Lederer Jr., said, “This is the 7th year for the publication of ‘Heroes,’ an annual tribute to the men and women who serve in the Armed Forces. Stars and Stripes is privileged to continue telling a few stories of the many who serve with remarkable courage and a degree of self sacrifice few of us will ever know. This edition features two Medal of Honor recipients and the first recipient from the wars in Afghanistan and Iraq to survive the dramatic events that led to his selection. “In partnership with the Congressional Medal of Honor Foundation, Stars and Stripes ‘Heroes’ relates the experience of a few warfighters, who stand as surrogates for thousands of others whose valor is equally inspiring. It is important that all Americans understand the daily sacrifice of our men and women. Telling the story of the US military by Stars and Stripes ensures the brave men and women will not be forgotten ‘Heroes’ is a salute to the honor and dedication of our military men and women,” Lederer continued. “Heroes” will be published overseas in the European, Pacific and Middle East editions of Stars and Stripes beginning June 14. Thanks to support from The Boeing Company, “Heroes” will then be distributed through military base newspapers in the United States and also through Department of Defense schools located stateside and abroad. Delivery to key outlets in the nation’s capital will include Capitol Hill, where House and Senate members will receive a number of hand-delivered copies; throughout the K Street “power corridor” and business community, and in The Washington Post. 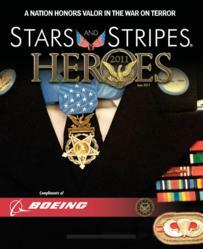 Following its publication in print, additional multimedia content and an enhanced version of “Heroes” will be available online at the Stars and Stripes website, http://www.stripes.com. Stars and Stripes reports on military matters as the independent source for news and information for the global U.S. military community. Editorially independent of any outside interference and influence, Stars and Stripes provides commercially available U.S. and world news and objective, factual staff-produced stories relevant to the military community it serves.